New Swiss tourist vignette still bad value for visiting drivers. Maybe. AN UPDATED ROUNDUP OF EVERYTHING YOU NEED TO KNOW ABOUT THE SWISS MOTORWAY VIGNETTE HAS BEEN POSTED HERE. Terrified their reserve fund for road maintenance will dip below 1,000,000,000,000CHF, the Swiss authorities will nearly quadruple the price of the annual motorway sticker. The vignette costs 40CHF (€33.33 – you can pay in euros) and can be bought from border staff. For how to avoid buying the Vignette in Switzerland see below. With the referendum on the price rise due tomorrow (24 November 2013) an updated version of this story can be seen here. 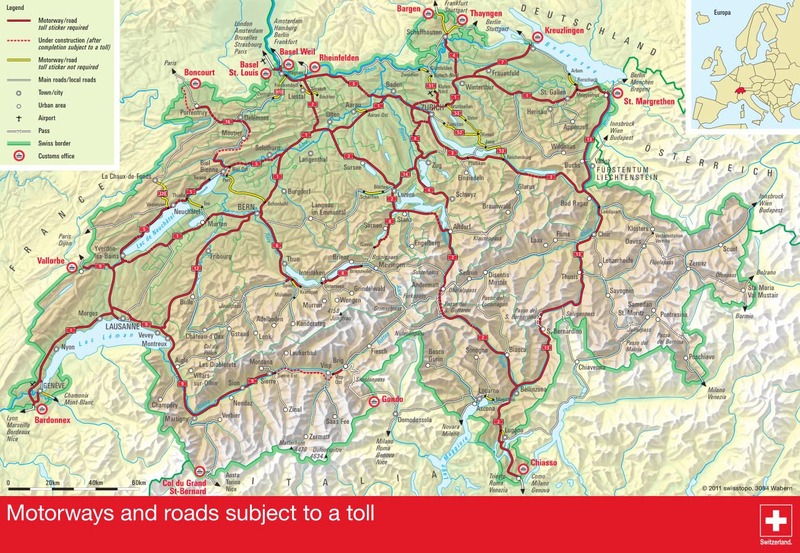 The chargeable Swiss road network. In 2015 more roads will be taken into the scheme. In 2016 the cost of using Switzerland’s motorways each year rises from 40CHF (€33, £28) to 100CHF (€80, £70). A new short stay vignette will be available for the first time, a two month sticker costing 40CHF. The windscreen sticker allows access to the national road network, motorways and expressways. Motorists caught without the sticker face a fine of 200CHF (€160, £140) plus the cost of a vignette. The controversial* increase, previously defeated in December, has been brewing for some time. It is the first increase in twenty years. Like the UK and Germany, Switzerland has been considering how to put road finance on a sustainable footing as it improves and expands the network. 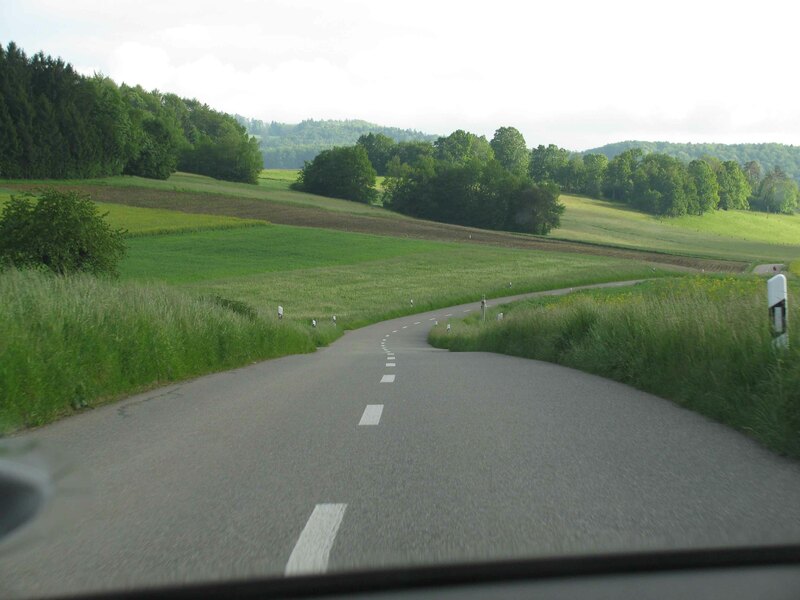 You don’t have to buy the motorway vignette to drive in Switzerland, it only applies to the national road network. Even the major motorway border points have backstreet detours. If you get caught in the vignette queue, in our experience border staff are happy to redirect you. 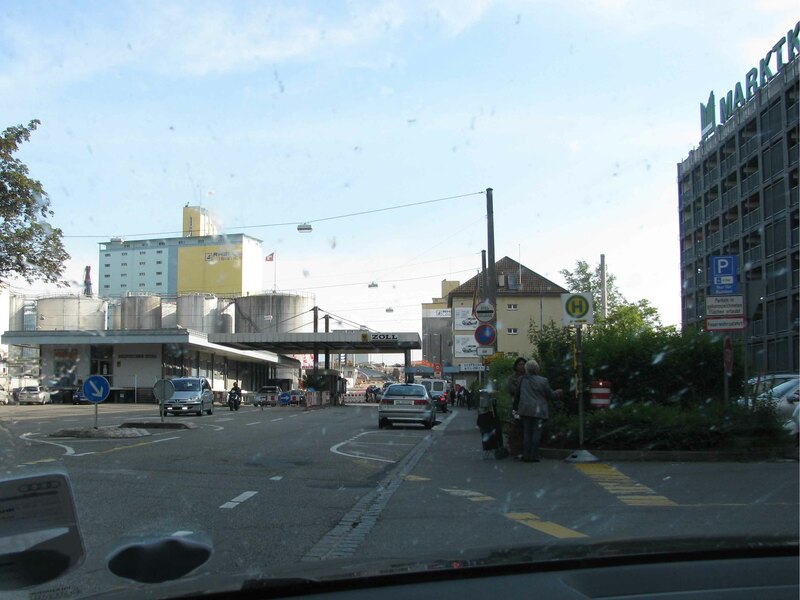 Photo: The Swiss suburban border point at Basel, May 2012. Now unused since Switzerland joined the Schengen Area. Crucially, the price increase is dependent on the national roads reserve fund falling below one billion Swiss francs, though nobody expects that not to happen. While the new short stay vignette means tourists escape the rise, previously the cost could be ameliorated over several trips. Two trips however will still be cheaper than the annual sticker. The annual vignette is valid from the beginning of December to the end of January the year after – fourteen months in total. It can be bought at the border or in advance from Swiss Railways (no discount!). Why drive on the motorways when the back roads are so pretty? Photo: literally ten minutes from the centre of Basel towards Reinach. Only drivers using Swiss motorways need pay the vignette. It does not apply to single lane main roads and some dual carriageways (see above). A trip across Switzerland by back roads is highly recommended. Switzerland as a country is also avoidable. Crossing France – to Italy for example – is equally expensive because of pay as you go road tolls, about €80 each way. Trips to Italy and south east Europe via Germany and Austria are only a bit longer. German motorways are free-at-the-point-of-use. Austrian tolls are relatively cheap. * At the Brussels Road Pricing conference in December, the Swiss Roads Ministry admitted the vignette subsidises Swiss railways. A number of ambitious projects are underway, like the 35 mile Gotthard Base Tunnel opening in 2016. Because of this the Swiss road lobby is vehemently opposed, as are their German counterparts. You should update this article. The increase toll did not go into effect.